Redwood Shores is a waterfront community in Redwood City, California. It is located along the western shore of San Francisco Bay on the San Francisco Peninsula in San Mateo County. Redwood Shores is the home of several major technology companies, including Oracle Corporation, Electronic Arts, Nintendo, Qualys, Crystal Dynamics and Shutterfly. Redwood Shores is located roughly halfway between San Francisco and San Jose, and is bordered by Belmont and San Carlos to the southwest. Foster City lies to the northwest and Bair Island to the southeast; both are separated from Redwood Shores by sloughs. To the northeast is San Francisco Bay. Bair Island technically connects Redwood Shores to Redwood City, but there are no bridges between Redwood Shores and Bair Island. As a result, there is no way to drive from Redwood City to Redwood Shores (and vice versa) without exiting Redwood City and passing through San Carlos or Belmont (via unincorporated San Mateo County). Redwood Shores was built up from reclaimed land in the marshes of San Francisco Bay in the 1960s, much like its neighbor, Foster City, but the development almost never came to be. The owner of the land, the Leslie Salt Company, filled in soft ground known as "bay mud" formerly used for salt-evaporation ponds, but a significant controversy developed over fears of its susceptibility to serious earthquake damage because the area is between and close to the San Andreas and Hayward faults. The ensuing battle between various government agencies and business interests eventually put Leslie Salt out of business. As a result, Bank of America became the owner of the development in 1972. It was the home of the Marine World/Africa U.S.A., California park from the 1960s to 1986, when the park moved to Vallejo, California (eventually becoming Six Flags Discovery Kingdom). The former location of Marine World has evolved into posh homes and townhomes, condominiums, apartments, parks, preserved land, and Silicon Valley business parks and headquarters, including the headquarters of Oracle Corporation. Redwood Shores is populated with multimillion-dollar homes and town-homes, condominiums, and apartment complexes. Many of the houses and condominiums surround waterways/lagoons and have access to inner waterways through private boating docks. According to Forbes magazine, Redwood Shores is placed on top of "America's Top Selling Luxury Neighborhoods in 2009". Major technology companies maintain headquarters in Redwood Shores, among them Oracle Corporation and Electronic Arts. The community also includes a branch of Ernst & Young, the headquarters of Relayware, a hotel (Sofitel Bay Area), Sandpiper Elementary/Middle School and Redwood Shores Elementary School, and a branch of the Redwood City Library. To the south Redwood Shores is bordered by the San Carlos Airport. Redwood Shores is the setting for college rowing races, including competitions among Pac-12 Conference universities. It is also the home of Bay Club Redwood Shores (more commonly known as the Pacific Athletic Club or PAC), a private sports club with 2 indoor/7 outdoor tennis courts, squash, pools, yoga, gym, water-park and clubhouse facilities. Pacific harbor seals have occasionally been spotted in the waterways/lagoons around Redwood Shores. The areas in and around the community are home to a variety of wildlife including raccoons, skunks, ducks, geese, egrets, great blue herons, clapper rails, harvest field mice, sting rays, jellyfish, and many other species. Canada geese pose a nuisance and the community is actively working on reducing their presence. ^ "Redwood Shores". Geographic Names Information System. United States Geological Survey. 6 April 1998. Retrieved 8 December 2016. ^ Woolsey, Matt (April 22, 2009). "America's Top-Selling Luxury Neighborhoods". Forbes. Retrieved October 1, 2018. ^ "Canada Goose Control in the Shores". Redwood Shores Community Association. February 29, 2012. Retrieved October 1, 2018. 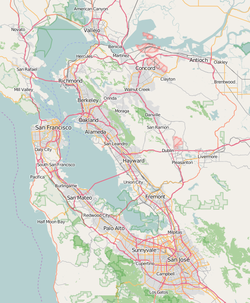 Wikimedia Commons has media related to Redwood Shores, Redwood City, California. This page was last edited on 15 March 2019, at 03:59 (UTC).